I’ve been hearing so much about SOPA (Stop Online Piracy Act) lately. Wikipedia and other sites took their sites offline for a day in protest of this Bill. Now, why are they against a piece of legislation that will fight online piracy? I mean, no one is FOR piracy. I for one don’t want someone using my copyrighted material or intellectual property without my permission or attribution – let alone profit from it. However, I would like to know if I’m committing an act that the bill would criminalize, and if this Bill will criminalize conduct that is currently permitted under the law. And I fear this bill would have an unintended chilling effect on free speech and innovation – instead of its intended, lofty goal of stopping internet piracy. I’m no expert on this matter; but I would like to know how this would affect me as a consumer, a blogger, and a web user. Proponents of the Bill purport that it targets foreign rogue sites and does not cover domestic web sites, such as blogs. But the act that the Bill would criminalize is vaguely defined. Furthermore, it doesn’t seem to carve out uses that are permitted under the current law, such as fair use. The fair use doctrine allows limited use of copyrighted material without permission from the copyright holder for the purposes of news reporting, commentary, criticism, parody, teaching, research, and library archiving. Without this exception, even criticism of someone’s copyrighted work could constitute infringement. Talk about a chilling effect on First Amendment. Additionally, is the onus on the ISPs, hosts, and search engines to blackout sites or delete links to the sites that they suspect of copyright infringement? If so, it would open these companies up to liability. And the fear of litigation and liability would discourage investments in these types of companies. Without investments, innovation would be stifled, or at least discouraged. That just doesn’t smell right, no? Having taken 4 years of Spanish, I know that sopa means soup. I wish I had been clever or resourceful enough to have prepared soup for this post. 🙂 But we got home late and were really tired. And I just didn’t have the energy to cook anything that required more than the bare minimal effort. Soup would have taken too much effort, unless it popped out of a can. So I looked in the fridge to find some grass-fed beef tenderloin and some kimchi. 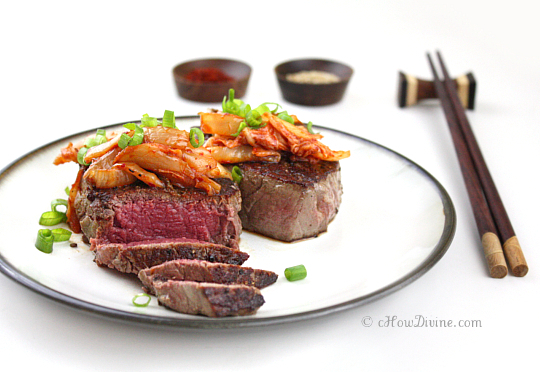 Decision was made: steak with some sautéed kimchi. It’s a perfect weekday meal for many reasons: 1) it’s so easy to make; 2) it’s visually pleasing; 3) it looks like you spent more time preparing it than you really did; and 4) it’s soooo delicious. Really! It only takes about 15-20 minutes to prepare. 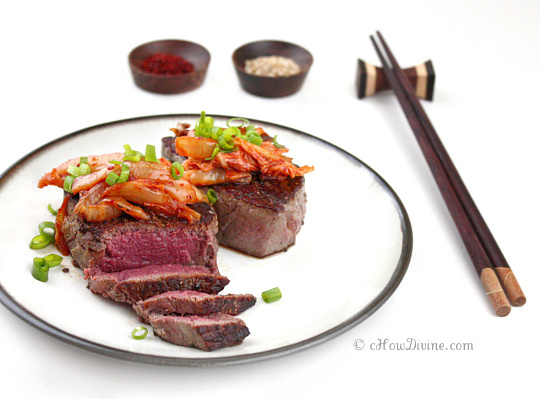 The sautéed kimchi complements the steak beautifully. And the steak just melts your mouth! Added 5/7/2012: Wow! The Huffington Post featured two of cHow Divine’s recipes – Bulgogi Kimchi Tacos and Filet Mignon with Sautéed Kimchi – in their “6 Foods Begging To Be Topped With Kimchi!” So excited. Thank you! In a small bowl, stir together soy sauce, agave or honey, sesame oil, sesame seeds. Set aside. Preheat a pan (preferably iron skillet or stainless) over medium-high heat. Add a couple of teaspoons of canola oil. Sprinkle salt and pepper on one side of the beef tenderloin. Place the salted side down on the preheated pan. Cook for about 4-5 minutes. The steak should have a nice sear. Right before you flip the steak, salt and pepper the other side. Flip and cook on the other side for another 4-5 minutes. Remove from heat and tent it with aluminum foil or parchment paper to keep it warm. In the same pan, add a dab of butter or drizzle of canola oil. Add kimchi and gochujang to the pan and stir to sautée. Sautée for about 3 minutes. Remove from heat. 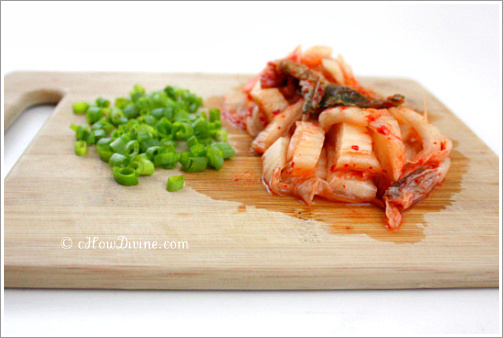 Divide the sautéed kimchi among the two steaks. Serve with the dipping sauce from step 1 along with some steamed rice. 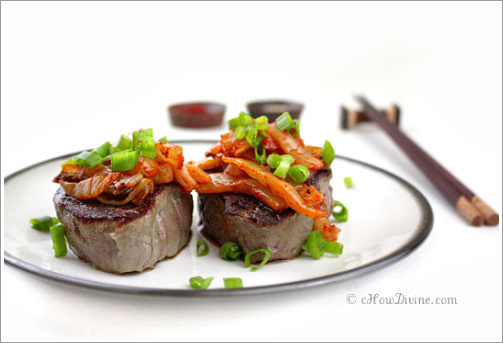 Filet and sauteed kimchi! What a brilliant idea! It makes perfect (delicious) sense. Thank you for the compliment! It’s really encouraging and means a lot for an amateur cook like me! I tried taking a look at your blog with my new iphone 4 and the layout doesnt seem to be right. Might want to check it out on WAP as well as it seems most smartphone layouts are not really working with your site. Thanks for letting me know! You should be able to view the mobile version now. Just select it on the bottom of the page.